Description: Symptoms within the “psychotic” spectrum are poorly understood and, due the unique experiences of each individual, hard explain in terms of their phenomenological, epistemological, and teleological roots. In other words, for the veteran who progresses beyond the standard symptomology of “Post-Traumatic Stress,” it is likely that the structure of his or her mental suffering will become more difficult to define, accurate diagnoses will come and go with the ebbs and flows in type and extremity of experienced symptoms, and the timeline previously used to understand the cause, emergence, and expectations of that individual’s struggle will need to be completely reinterpreted. 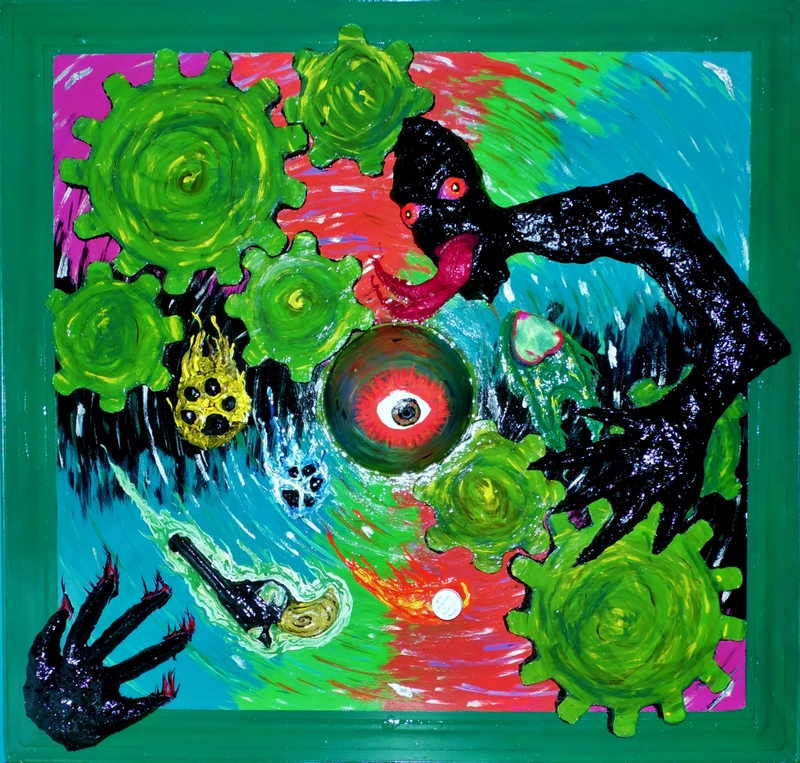 This work of art, entitled “Psychotic Disorder NOS,” or, “Not Otherwise Specified,” attempts to isolate and define the early symptoms of what was later diagnosed in me as “Schizoaffective Disorder.” This work is meant to be viewed from the “eye-to-eye” perspective; viewers staring directly into the pupil at the work’s center will see a mirror which reflects what the brain exposed behind that pupil sees, and that scene should be shared with the viewer. However, it is at the pupil’s threshold that the similarities between the viewer’s experience and the subject’s ends. Proceeding further back within the three dimensional work, one sees the beginnings of a whirlpool, first surrounding the eye, then filling the background with vivid colors running counterclockwise, colors indicative of sensory input amplified by hypervigilance. In short, what enters into the brain through the pupil—reality, because it is always moving and increasingly intense, is incapable of being understood normally. Emerging from this whirlpool, but not extending beyond the pupil’s threshold, first, is a number of cogs. These cogs represent paranoia as a machine, and it’s one that takes the reality reflected by the pupil’s mirror and reinterprets it using delusions and fear. Solidifying those false interpretations are the whispers of auditory hallucinations, visualized here, and experienced by me as, a black, lascivious demon of a creature whose primary goals are to provoke hostility, self-doubt, and suicidal ideation. It is this “puppet master” who attempts, continuously, to use my symptoms to force me into isolation. Also trapped within the whirlpool are a series of items whose duality allows them to work for or against the paranoid machine: a mold of a gun owned by my father represents both heritage and suicidal ideation; molds of my dogs’ paws are sources of comfort but also an ever-present fear of loss; a prescription pill bottle might represent drug abuse or it might represent ameliorated symptoms; and, finally, a heart-shaped box representative of my girlfriend is always there for me to draw upon for strength, but often accessible only after I have silenced the whispers and reduced the paranoia enough to trust.